Epoxy floor coatings are commonly used for commercial and industrial flooring. Epoxy coatings are normally applied over concrete floors to provide a high-performance, smooth, and durable surface that can last many years and withstand heavy loads. 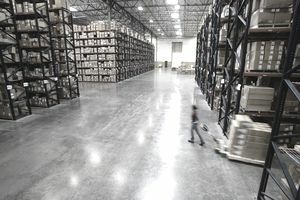 Many industrial sites, warehouses, and commercial buildings rely on epoxy floors to maintain clean and safe conditions for workers, equipment, and inventory. An epoxy coating requires a clean and slightly porous surface to adhere properly. Epoxy may not bond to sealed or polished concrete. The concrete also must be fully cured. Before apply epoxy floor coating, it is important to patch and repair all major cracks and chips in the concrete surface and to remove all grease. If the concrete is old, test the surface for previous layers of epoxy or other products that might have been applied over the years. To test for sealant, pour a small amount of water onto the floor. It should soak in. If the water beads on the surface rather than soaking in, it likely has been sealed and may not be suitable for an epoxy coating. Before applying an epoxy coating, make sure that the temperature is suitable, and follow all manufacturer's recommendations. Unfavorable temperatures can cause the epoxy to bubble and peel. Epoxy is a two-part liquid that you mix before application. Once the product is mixed, you have a limited time to apply the epoxy coating before it starts to harden. Depending on the product being applied, you might need to apply an epoxy primer and finisher coat. The primer is applied just like paint and is allowed to settle for several hours before the epoxy goes on. To apply the primer, cover the floor with a thin layer of water, then spread the primer with a roller pin on a pole, spreading it out in a thin layer over the entire floor. Let the primer dry, then apply a second coat. The finisher is applied in the same manner as the primer but without the water layer.